There were fun and shenanigans on Saturday at the Grainger Market. 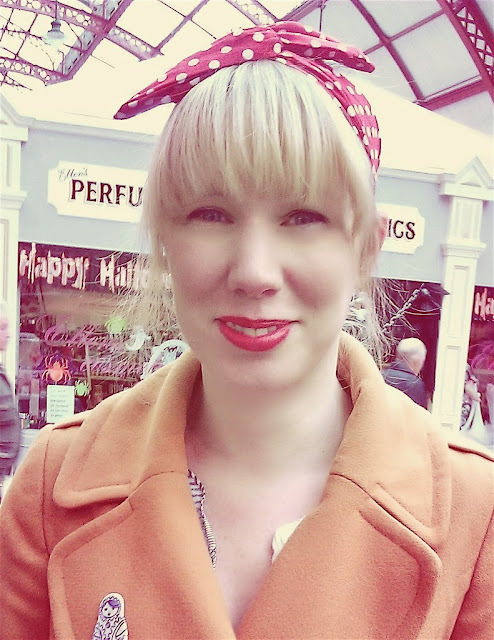 It was the November Make and Mend Art, Crafts and Design Market but this month it had a 50's theme. I was very excited as I LOVE this decade and it's an excuse to get dressed up! Here is me with my red polka dot head scarf. I was wearing a lovely blue and white print dress under my thick coat but due to the extreme chilly weather my dress never saw the light of day. They were all rocking some awesome 50's styling, check out more photos from the event here. If you ever get a chance to visit the Make and Mend please do you will get to see some lovely talented local designers like Britt Coxon, Flip Knit Stich, Pretender to the Throne, Dabble Dabble and Low Moon Over High Town.